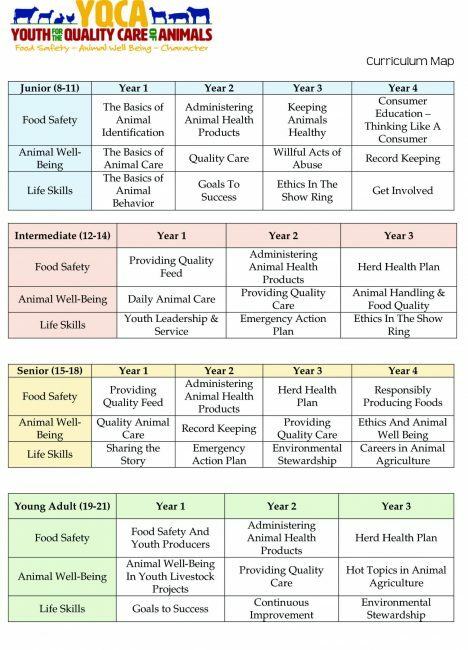 Youth for the Quality Care of Animals (YQCA) is a new set of web-based modules being required for youth in the Beef, Goat, Poultry, Rabbit, Sheep, and Swine projects instead of the former MAQA. It is also required to show Dairy at the State Fair. (Please note that MAQA is now YQCA) This program will allow youth to learn about other species of animals; not just the species they show. This program allows for the consistency of information being taught to youth in all states and in all species of animals. YQCA gives families more flexibility in gaining this required certification, which is more convenient to accommodate busy seasonal schedules. It’s estimated that youth will spend roughly 60 minutes completing modules each year. 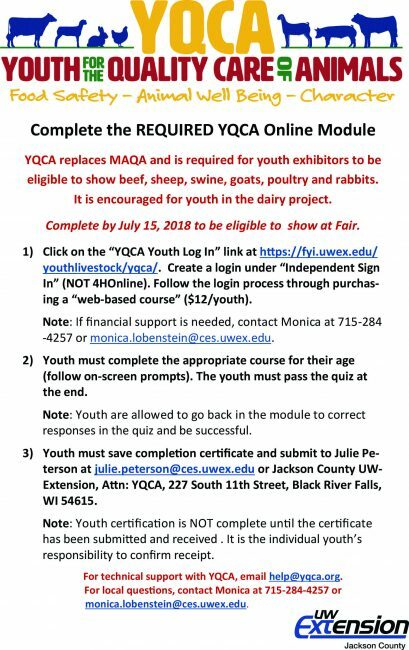 Youth must complete the YQCA module for their age by July 15, 2018 to be eligible to show Beef, Goats, Poultry, Rabbits, Sheep, and Swine at the Fair. To complete the YQCA module or to get more information, go to https://fyi.uwex.edu/youthlivestock/yqca/. Cost for YQCA is $12 each year. Requests for an appointment for use of a computer/internet and scholarships are available by confidential request to Sarah Tanis, sarah.hoffman@ces.uwex.edu or 715-284-4257.